Finished eyeing the line FMQ on this baby quilt. Click here to see more of the quilting. I used warm and natural that says it can be quilted up to 10" apart. All the squares that were formed by the quilting are less than that. My question is when is quilting enough quilting? I'm linking to Leah's FMQ Project and Sarah Whoop, Whoop. Get inspired! My theory is that there is enough quilting in the quilt when it makes you happy to look at it! I use more or less depending on the design and the intended use. I tend to keep adding more. Fantastic Angie! Congrats on a great finish and on the FMQ. You know me I'm a dense quilter in negative space but I agree with Joan and Billie... When it looks pleasing to your eye... Thanks for sharing it with us! What a beautiful quilt. 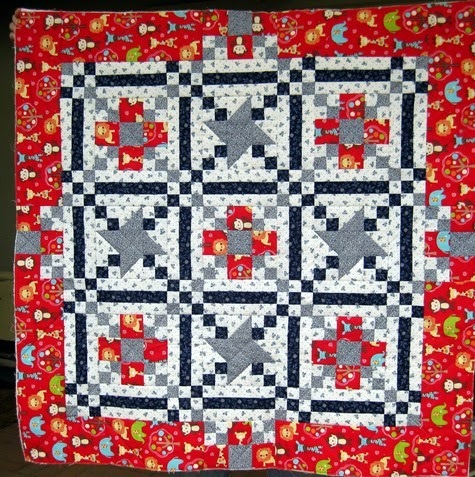 I love how you used the nine-patches along with the sashing and corner squares (is that what they're called?) to make the strong diagonals, in two colors, no less! I'm a fairly novice quilter but I've been around quilts for a long time. I think quilting at 10" is too little even though the batting says it can be so far apart. I think the front and back layers of the quilt will have more stress than if they had a little more quilting to keep them fastened in place. But like the others said, you'll know when it's finished. That's a great finish! When is the quilting enough - LOL - I don't think I'm the one to ansewr that :) I like to have the quilting no further than 2 inches apart. But I like to feel the quilting on my quilts. I think the key thing is however much quilting you do, whether it's inches or ten, it should be consistent across the quilt. I, too, think quilting is enough when you are happy with it. When you're entering competition, though, enough is whatever the judges think, and that's subjective. I wonder if entering quilts in competition is worth it! :) The gray in this really makes the red pop! So pretty! 9 patch chains are one of my favorite settings, too. I tend to quilt closely, not dense, just closely. But it depends on the quilt, too. Some designs just don't require much quilting.